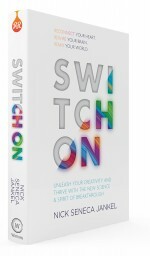 Switch On presents a compelling science-driven, wisdom-inspired answer to the most pressing question of the age: How do we as individuals, and our world as a whole, thrive? It is based on 20 years of research and experience at the forefront of personal, social and corporate change. The result is Breakthrough Biodynamics, a groundbreaking fusion of the latest neuroscience, evolution , ancient traditions, practical philosophy and powerful tools for making transformation happen. Category: Books, Self Help & Personal Development Tags: ancient wisdom, Conciousness, evolution, identity, mindfulness, personal, philosophy, science, shaman. Nick is a shaman for the 21st Century, helping over 50,000 individuals, hundreds of world-class organisations (like Nike, Coca Cola, Disney, Virgin, PepsiCo, Xbox & Oxfam), a number of national governments and millions of TV viewers across the globe to switch on, break through difficult challenges, embrace change and thrive. He was educated at Cambridge, becoming a wisdom teacher and philosopher after a successful career in advertising and the tech world. Once a medic, he now works as a breakthrough coach and consultant, using the theory and framework he has created over 20 years at the forefront of personal and corporate change, Breakthrough Biodynamics. He is a passionate advocate of people-powered, heart-led, social change. The Sunday Times called him a ‘glam spiritual activist’. Nick hosted a 4-part BBC TV series on addiction, in which he helped people break through theri addictions; and coached a major celebrity on MTV. He co-hosted a major festival tent with Kelly Osbourne; and his tips and insights into how to thrive have been featured repeatedly in publications such as The Guardian, Financial Times, OK!, The Daily Mail, Top Sante, and Cosmopolitan. Nick is a lifelong raver, serial entrepreneur (he started his first company at 25) and was once a science teacher in a far-flung corner of Africa. He now runs creative management consultancy www.wecreateworldwide.com; and media company www.ripeandready.com that offers ‘wisdom without woo woo for wellbeing & world-change’.